This is a fun skill game in which you will have to move as fast and as agile as a ninja. Try to defeat all the enemies that you will find during your climb on the platforms. Jump as well as you can and try to collect the coins and all the other power-ups as well. There will be some other opponents that you need to take care of as they will hurt you with spears and arrows. Kick them and try to combo more of them one after the other to receive more bonus points. Have fun and keep in mind that you will have to try not to fall in between the brick platforms. 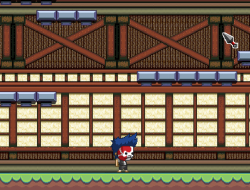 Use arrow keys to move and jump, Z to attack and X for a ninja jump. Skyward Ninja 0.00 between 0 and 10 based on 0 votes.